We launched Google Realtime API in 2013 to help developers build collaborative apps using familiar JSON-based data models, while leaving the complexities of real-time synchronization to the API. Since then, we've developed other fast, flexible cloud-based storage solutions like Google Cloud SQL and Google Cloud Firestore. As a result, we’ve decided to deprecate Realtime API in favor of these new, powerful solutions. Google Cloud SQL: Fully-managed database service that makes it easy to set up, maintain, manage, and administer your relational PostgreSQL and MySQL databases in the cloud. Firebase Realtime Database: Cloud-hosted NoSQL database that lets you store and sync data between your users in real-time. Google Cloud Firestore: We recently announced Cloud Firestore to help developers build responsive apps that work regardless of network latency or Internet connectivity. If you're curious about Firebase Realtime Database vs. Cloud Firestore, we've got you covered. Existing Realtime API client applications will continue to work normally until December 11, 2018, but we are no longer accepting new clients of the API. After the API is decommissioned, to facilitate migration, we will continue to provide a mechanism for applications to access document contents as JSON. We know developers and partners have come to rely on Realtime API and that migration may be a significant effort. We hope that the deprecation timelines summarized below allow for a smooth transition. Realtime API documents become read-only, and attempts to modify document contents using the API fail. Realtime API is shut down, but a JSON export API remains available. 1 Projects which accessed the Realtime API prior to November 28, 2017 will continue to function as before. All other projects, including new projects, will be blocked from accessing the Realtime API. Applications using the Realtime API will need to migrate to another data store. Our migration guide provides instructions on how to export Realtime document data and also how that data can be imported into Google Cloud Firestore. 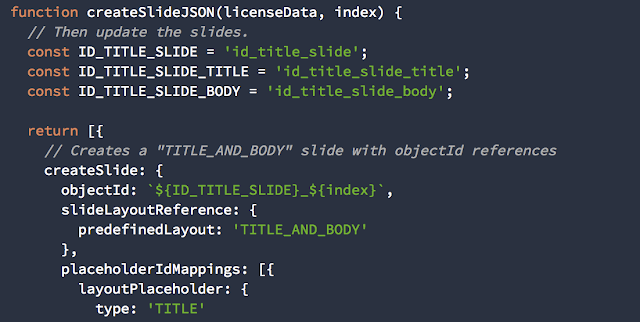 After Realtime API is shut down, we will continue to provide a means for exporting Realtime document contents as JSON. You can read more about the deprecation in our documentation. If you have questions that aren’t answered there, see the support page for how to get help. Email remains at the heart of how companies operate. That’s why earlier this year, we previewed Gmail Add-ons—a way to help businesses speed up workflows. Since then, we’ve seen partners build awesome applications, and beginning today, we’re extending the Gmail add-on preview to include all developers. 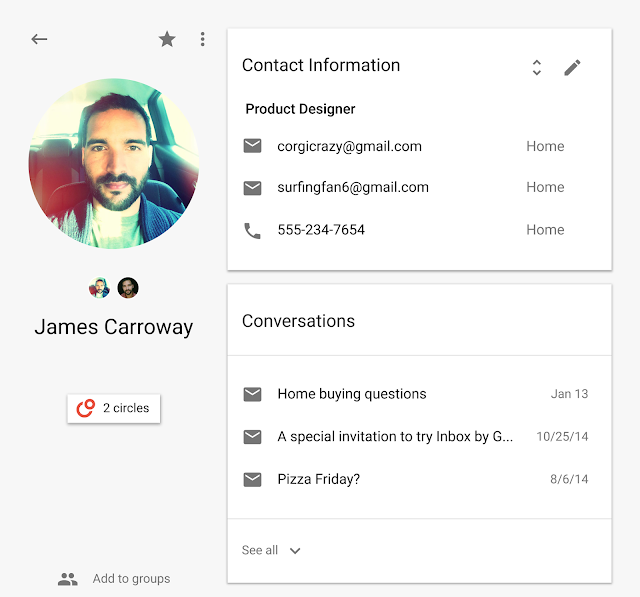 Now anyone can start building a Gmail add-on. Gmail Add-ons let you integrate your app into Gmail and extend Gmail to handle quick actions. They are built using native UI context cards that can include simple text dialogs, images, links, buttons and forms. The add-on appears when relevant, and the user is just a click away from your app's rich and integrated functionality. Gmail Add-ons are easy to create. You only have to write code once for your add-on to work on both web and mobile, and you can choose from a rich palette of widgets to craft a custom UI. Create an add-on that contextually surfaces cards based on the content of a message. Check out this video to see how we created an add-on to collate email receipts and expedite expense reporting. Per the video, you can see that there are three components to the app’s core functionality. The first component is getContextualAddOn()—this is the entry point for all Gmail Add-ons where data is compiled to build the card and render it within the Gmail UI. Since the add-on is processing expense reports from email receipts in your inbox, the createExpensesCard()parses the relevant data from the message and presents them in a form so your users can confirm or update values before submitting. Finally, submitForm() takes the data and writes a new row in an “expenses” spreadsheet in Google Sheets, which you can edit and tweak, and submit for approval to your boss. Check out the documentation to get started with Gmail Add-ons, or if you want to see what it's like to build an add-on, go to the codelab to build ExpenseIt step-by-step. While you can't publish your add-on just yet, you can fill out this form to get notified when publishing is opened. We can’t wait to see what Gmail Add-ons you build! You might have seen that we recently announced new Google Slides add-ons. We worked closely with several technology partners to build these new add-on solutions to help speed up workflows. 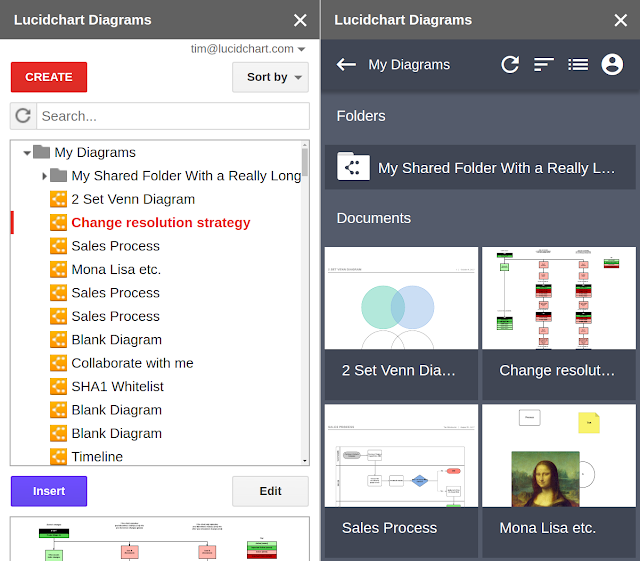 One partner, Lucidchart, worked closely with Google to create a new integration that brings added diagramming functionality to Slides. We sat down with Tim Winchester, engineering lead at Lucidchart, to learn more about how his team built the new Lucidchart add-on for Slides. Tell us about the Google Slides add-on you built for Lucidchart. We built it as a sidebar add-on that allows users to insert diagrams directly into Google Slides from within Slides (instead of having to export diagrams from Lucidchart). You can also create a new Lucidchart diagram from within Slides, and simply select “Back to Slides” once you’re finished creating your diagram in the Lucidchart editor. You can modify an existing diagram by clicking “Edit” within Slides. This option will direct you to the Lucidchart editor so you can revise as needed. Once you’ve finished revising, or any time you know a diagram has been updated in Lucidchart, select the refresh button from the Lucidchart Diagrams sidebar. What prompted you to create your add-on? Specifically, how did you envision your add-on would improve user experience? Lucidchart is a visual communication platform, but we know our users sometimes need to have their diagrams available in other places. One of the most popular uses for Lucidchart is in presentations, so an add-on for Slides was a natural fit. Tell us about how you built your solution. Since we already had existing add-ons for Docs and Sheets, this project was less about building from scratch and more about adapting what we already had, then doing rewrites as needed. We started by abstracting app-specific functionality of our existing add-ons into a pluggable IntegratedApp interface. We then implemented the interface for Slides using the new SlidesApp API. Once we had reached feature parity, we created a few new additions, such as a “Refresh All Inserted Diagrams” button, which users could find more easily than a top bar menu entry. At the same time, the Lucidchart add-on was undergoing a major UI overhaul, which was the most challenging and time-intensive part of the project. Because we liked the results of the UI update in Slides, we refactored the add-on code to make it more generalizable, then ported it back to our Docs and Sheets add-ons. Did anything surprise you during the build? As a security measure, the sidebar iframe can only render elements within its borders, so we couldn’t simply throw a <div> into the center of the screen in client code. Instead, we had to fire an event that the Apps Script backend would handle to create a modal dialog, using printing scriptlets to add whatever data we needed into the dialog’s HTML. Thus, any JS object sent from the sidebar to a modal has to be serialized and deserialized in the process, which means that the sidebar cannot directly detect any events emitted by the modal. Do you have any code snippets that you can share? What advice would you give other developers looking to build similar add-ons? If you are planning to develop multiple similar add-ons that mainly differ in the G Suite app with which they integrate, you should find this technique of reducing the overall code amount by isolating duplicative code immensely useful. After completing the first add-on, creating another add-on for a new G Suite app is just a matter of updating a new copy of IntegratedApp to work with the new app; the rest of the codebase can be commonly shared. In our case, it means that the updated UI was easily added to our Docs and Sheets add-on after we completed the Slides add-on. Learn more about how you can create your own Slides add-ons or choose from a number of publicly available APIs to customize your G Suite applications. If you’re interested in becoming a Google Cloud technology partner, you can also join our partnership program. To get started, check the documentation to learn more about Apps Scripts for Slides, or check out the Translate and Progress Bar sample Add-ons. If you want to dig deeper into the code sample from our video, take a look at the corresponding tutorial. And, if you love watching videos, check out our Apps Script video library or other G Suite Dev Show episodes. If you wish to build applications with Slides outside of the Apps Script environment and want to use your own development tools, you can do so with the Slides (REST) API—check out its documentation and video library. Google Classroom makes it easy for teachers and students to use the edtech tools they love, and that’s not just limited to Google tools. With the Classroom API, hundreds of developers have built integrations with Classroom that make it easier for admins and teachers to manage classes, share content and more. One popular way that applications integrate with Classroom is by re-using Classroom rosters—teachers can import their classes with a click and students don’t have to have a new login. Today, we’re making it easier for developers to keep rosters in-sync between their apps and Classroom by launching real-time notifications of changes. Now, an application can now receive roster changes for a domain, or for an individual course. Powered by Google Cloud Pub/Sub, a state-of-the-art messaging service for passing information between applications, developers no longer have to poll various Classroom API endpoints for changes, which gives teachers and students a more seamless experience. If a new student joins or leaves a Classroom class, that roster change can be automatically applied across applications. Flat Education, a collaborative music notation app, uses the new updates to instantly update class rosters. Before, when teachers and students accessed the Flat Education application, it would poll the Classroom API for changes and then make updates, delaying data. Now, roster data can be refreshed instantly. With today's Classroom API update, applications can sync roster data instantly. When a new student joins Google Classroom (bottom left), the student is instantly added to the corresponding music class in Flat Education (top right). Create and update announcements. Last year, we launched the ability for external applications to access and create assignments and questions. This update gives applications access to all the posts in Classroom. Create and update individualized posts. Earlier this year, we made it possible for teachers to post to individual students in Classroom and now, applications can do the same programmatically. This is especially helpful for applications that help teachers differentiate and individualize learning. For more details on what you can build with the Classroom API, check out the documentation. You can also ask questions (or answer them!) on StackOverflow using the google-classroom tag, and report bugs or feature requests via the issue tracker. Lastly, let us know what you're building using the #withClassroom hashtag on Twitter or Google+. In spring of this year, we migrated our G Suite issue trackers to a new system based on our internal tracker. This carries a lot of benefits, including improving our ability to track how issues reported from outside of Google relate to bugs and features we’re working on internally. We also have an internal Apps Script API that talks to our issue tracker, which we can now use to work with issues reported from outside of Google. As soon as the migration was finished, we put Apps Script to work monitoring…itself. Now we have a script in place that monitors Apps Script issues as they are reported and upvoted on the public tracker. When we see an issue that’s having widespread or sudden impact, the script generates an alert that we can then investigate. With the help of our large, active community of developers, and leveraging Apps Script, we’re now able to identify and respond to issues more quickly. There’s no substitute for independent monitoring, and our Apps Script-based approach isn’t the first or the last line of defense. Instead, this new script helps us catch anything that our monitoring systems miss by listening to what developers are saying on the tracker. Please help us keep Apps Script humming! When you notice a problem, search the issue tracker for it and file an issue if it's new. Click the star to let us know you’re affected and leave a comment with instructions to reproduce, along with any other relevant details. Those instructions and other details help us respond to the issues more effectively, so please be sure to include them. To make Apps Script a friendlier environment for developers, we are announcing general availability of a new integration with Google Stackdriver. This is in addition to the pre-existing Logger service, which is still available. Log messages can now be sent to Stackdriver Logging using the familiar console.log(), console.info(), etc. functions. You can also instruct Apps Script to log messages and stack traces for all exceptions, which also become available for analysis in Stackdriver Error Reporting by simply checking a box. No need to add a single extra line of code. In Stackdriver, logs are kept for 7 days for free, and the premium tier offers 30-day retention. Powerful search and filtering are available to quickly find log entries by text content or metadata, and developers can also choose to export logs to BigQuery, Cloud Storage, and Cloud Pub/Sub for further analysis, long term conservation, and custom workflows. Log messages and errors are reported for all users of a script, with a unique but obfuscated identifier assigned to each user. 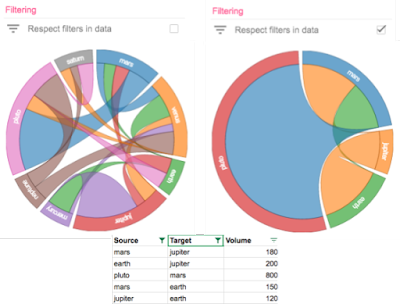 This means log entries can be aggregated anonymously per user, for example allowing developers to count unique users impacted by an issue or analyze user behavior, but without logging users’ personally identifying information. Developers get some of these aggregated analyses for free. In the Stackdriver Error Reporting tab of the developer console, you can see recurring errors and the numbers of users impacted. You can even subscribe to receive an email alert when a new type of error is detected. Developers of scripts and add-ons have started to rely more on more on this new logging capability. 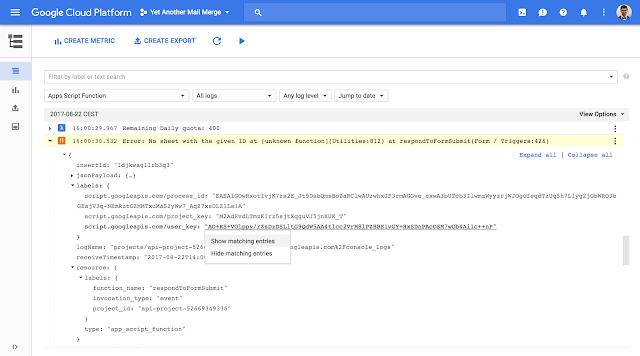 Romain Vialard, creator of Yet Another Mail Merge, a popular Google Sheets add-on, is using Stackdriver Logging to time the execution of his add-on, exporting data to BigQuery to perform aggregations and analyze trends. 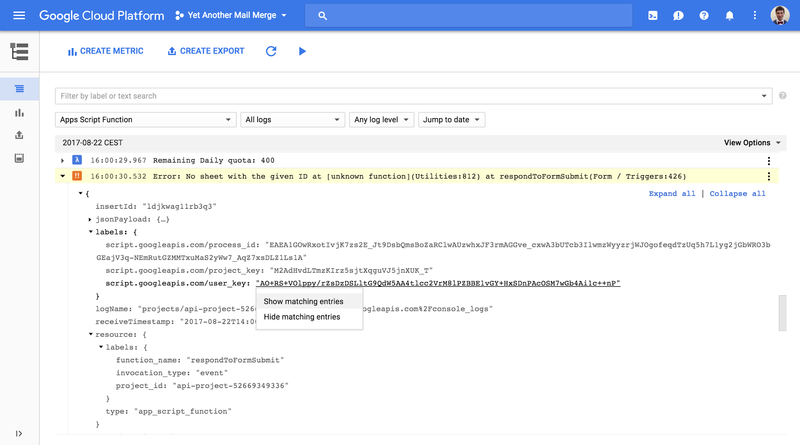 Read this tutorial to learn how to export logs to BigQuery and run queries to analyze how users are interacting with your script. Stackdriver Logging is one of the ways we’re making Apps Script a more manageable platform for developers. We hope that it and other features coming soon make Apps Script developers more productive and their scripts, add-ons and integrations more robust. You can read more about how to enable and use the Stackdriver integration by reading Apps Script’s logging documentation. Romain Vialard is a Google Developer Expert. 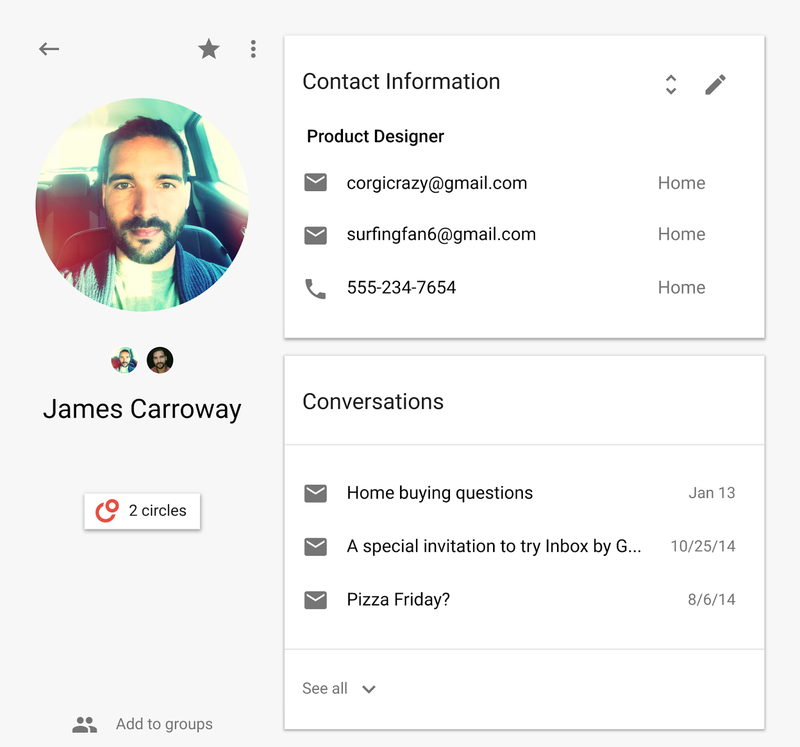 After some years spent as a consultant, he is now focused on products for G Suite (formerly Google Apps) users, including add-ons such as Yet Another Mail Merge and Form Publisher. Paul McReynolds is a Product Manager at Google focused on Apps Script and G Suite Marketplace. Previously a startup founder and CTO, Paul believes that the easy things need to be easy or the hard things don’t get done. At Google, he's excited to be a part of the company that makes solving problems for business fun again. Editor's note: Yet Another Mail Merge and Form Publisher are not created, sponsored, or supported by Google. Last fall, we launched the Google Slides API. Since then, partners, developers and others have been building apps and tools to programmatically create slides that work across desktop and mobile, like the ever popular md2googleslides. We recently released the Slides API Codelab, which walks you through an example of using Google’s BigQuery and Slide APIs to analyze 3.5 million repositories and create a “Top 10 OSS licenses” presentation. The codelab is a great exercise for learning the Slides API, especially if you have an interest in big data, automating the creation of presentations or open source. To get started, clone the repo. After running the starter script, you’ll find that creating a presentation is divided up into contained steps. These “TODOs” are shown when running the sample app in the start directory. To query GitHub, BigQuery has a public dataset all ready just for you! BigQuery allows you to query massive datasets on Google’s infrastructure in seconds. On bigquery.cloud.google.com, you can explore BigQuery’s public datasets or upload your own. In this codelab, we’re interested in open source licenses, so we'll query public repos on GitHub and grab their licenses. With an infinite number of public and private datasets out there, imagine all the data you can analyze with BigQuery and all the slide decks you can auto-generate with the Google Slides API! The goal of the Slides API Codelab is to get you up-to-speed quickly using both. For issues or questions regarding the Slides API or this codelab, ask us a question on GitHub or Stack Overflow. You might be using the Google Calendar API, or alternatively email markup, to insert events into your users’ calendars. Thankfully, these tools allow your apps to do this seamlessly and automatically, which saves your users a lot of time. But what happens if plans change? You need your apps to also be able to modify an event. If you missed it, check out this video that shows how you can insert events into Google Calendar as well as the official API documentation. Also, if you have a Google Apps Script app, you can programmatically access Google Calendar with its Calendar service. The Drive API can help a variety of developers create solutions that work with both Google Drive and Team Drives. Whether you’re an Independent Software Vendor (ISV), System Integrator (SI) or work in IT, there are many ways to use the Drive API to enhance productivity, help your company migrate to G Suite, or build tools to automate workflows. Every company has workflows and processes that are unique to its business, customers and employees. Often, these are captured manually within large spreadsheets or ad-hoc databases with macros and scripts. But what if they could be turned into custom business apps instead? Apps that provide useful UIs and distinct user roles, while helping to minimize data entry errors and increase productivity? And for those who’d like more detail, here is a recap of my presentation. “App gaps” are a reality for most companies, even those that embrace major SaaS products. Think about the edge cases that aren’t addressed with a standard CRM offering like conducting territory planning or tracking asset performance. We experienced similar gaps at Google. A few years ago, our HR recruiters were overwhelmed with the thousands of monthly interviews that each generated lengthy feedback reports from multiple interviewers. This volume made it difficult for hiring committees to calibrate candidates and make timely decisions, and resulted in delayed responses. To fix this, our IT team decided to build an app by cobbling elements from our own infrastructure. Over time, more app requests came in from other parts of Google, so we created App Maker. What started as a handful of apps within Google, evolved into nearly 400 internal apps used by thousands. Plus, the majority of these apps were built by non-engineers outside of IT. Today, App Maker gives software engineers and citizen developers—like business analysts or coding enthusiasts—the ability to quickly build and deploy apps to get around their workflow challenges. App Maker makes it easy to build apps in days, not months, because of its easy data-binding and drag-and-drop UI design. You can also integrate your apps with various data sources, Google services or APIs to cover broad legacy assets. Any app you create is also a part of Drive in G Suite so your data never leaves your domain. Define your data models, by importing existing Google Sheets to App Maker, connecting to Google Cloud SQL instances, or manually defining custom objects field by field. Build your UI by adding pre-built components like data entry forms, report templates and easily create event triggers and application flows. App Maker is currently in Early Adopter Program (EAP) for every G Suite Business customer. To get started, apply here. If you have a large Sheet with more than a handful of users updating it regularly: Sheets usually have an underlying workflow. An App Maker app will provide a better UI for it—showing the workflow visually, prompting for actions and eliminating data entry errors. If you perform recurring bulk operations in Calendar or Gmail: Say an employee joins or leaves a department, you can build an App Maker app to generate the appropriate bulk-operations in a few clicks. If your company is already using Apps Script and BigQuery: This means you’ve already invested in customizing workflows. App Maker can increase the velocity of developing custom apps. Go build your apps with App Maker in G Suite—sign up for the EAP today. 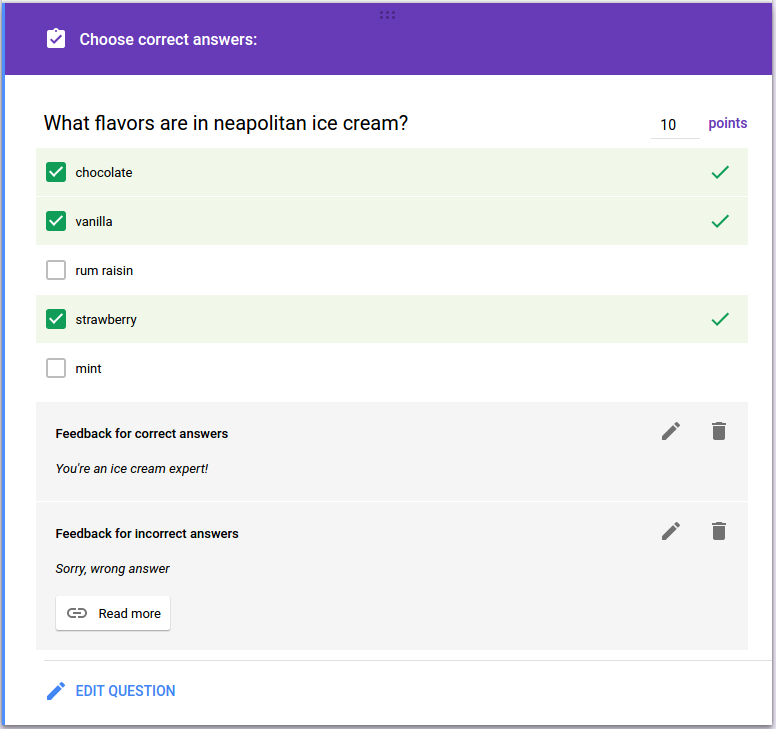 Last year, we launched Quizzes in Google Forms to help teachers and students take assessment to scale. 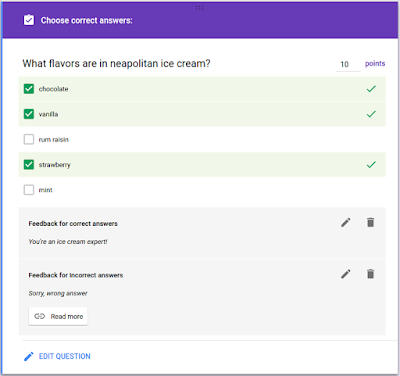 Using Quizzes, teachers are able to automate testing and give feedback to students faster by having Forms check responses against correct answers automatically. 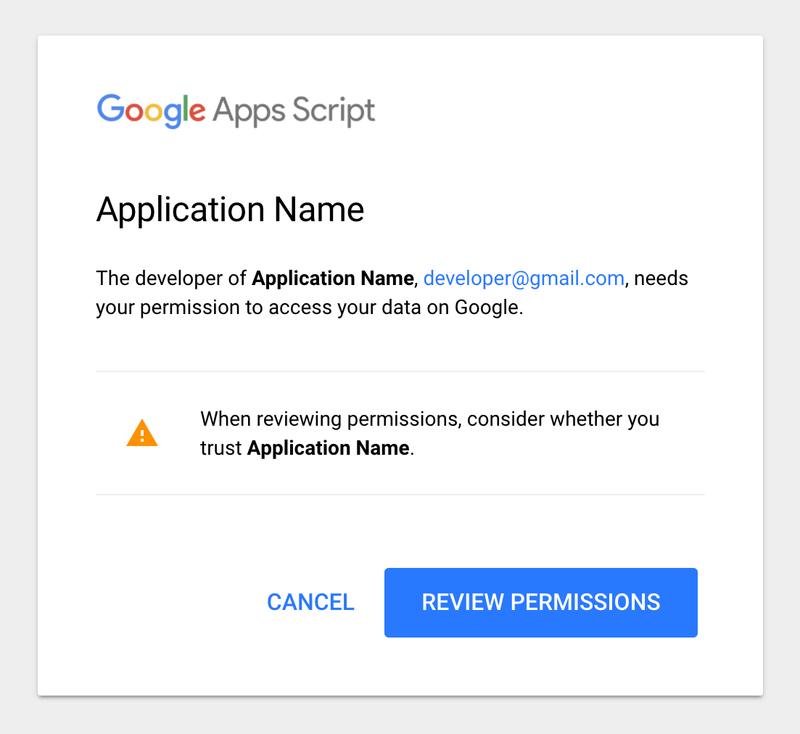 Today, we are making that functionality available to developers by extending the Google Apps Script Forms Service. With this feature, you can create and customize quizzes programmatically with Apps Script. Let’s take a look at an example use case and relevant code snippet. Multiple choice, checkbox and dropdown questions can be auto-graded, which means students can see their grades immediately upon submission. This is done by designating which options are the correct answer. Teachers can also set automatic feedback to show correct or incorrect responses, as well as assign point values to the question. // Make sure the form is a quiz. //read more about ice cream. For more details on what you can build with the Apps Script Forms Service, review the documentation, ask questions on Stack Overflow or in the G+ community, and let us know what else you’d like to see using the new public issue tracker for Apps Script. However, while both elements are in the field mask, we’ve only provided the update data for bold. There’s no data for italic setting specified in the request body. In this case, for all cells will be reset, meaning if the cells were originally italicized, those italics will be removed after this API request completes. And vice versa, if the cells were not italicized to begin with, they’ll stay that way. This feature gives developers the ability to undo or reset any prior settings on affected range of cells. Check out the video for more examples and tips for using field masks for update requests. Developers using Google Apps Script can now access the richer feature set of the updated Google Sheets API with the recent launch of the Advanced Sheets Service. One key benefit of using an advanced service vs. native Apps Script objects, is that developers can access current API features (without having to wait for native support to come along). For example, the advanced service allows developers to access Sheets filters which make Add-ons more engaging. With the Sheets API, developers can already get filtered rows or set new filters on Sheets data. With the Advanced Sheet Service, developers can now have their Add-ons respect those filters and apply new filters to modify what data is visible in the Sheets UI. Plus, with any of the Apps Script advanced services, you can easily access the Sheets and other Google APIs without using the UrlFetch service nor managing the authorization flow that you’d otherwise have to perform if using the REST API directly. The snippet below will return the indexes of the filtered rows in a given Sheet. Note that it is also possible to retrieve the list of rows hidden manually, using the "hide row" menu item in Google Sheets, as indicated in the API documentation. In the code sample here, we’re only exposing rows hidden by filter. The fields parameter in the code snippet limits what's returned in the Sheets API response, requesting only the values that matter to your app. For more information, check out this page in the Sheets API doc or this recent video on field masks. Yet Another Mail Merge: this Add-on helps users send email campaigns from a spreadsheet and is built to process only the filtered rows of a Sheet. Let's say you have a list of people who are registered for an event, but you've only accepted some of these registrants and need to send an email confirmation. With Yet Another Mail Merge and the updated API, you can filter out people you don't approve to attend and the Add-ons skips them without sending confirmations. Sankey Snip and Chord Snip: these Add-ons helps users create special chart types that aren't available in the Google Sheets UI. When respecting filters is enabled with these Add-ons, the charts will dynamically visualize filtered data. Check out the example below from the Chord Snip Add-on. Now, you can determine filters applied in a Sheet directly through the Sheets API or through Apps Script apps and Add-ons using the Advanced Sheets Service, and continue to build the best experience for your users. Romain Vialard is a Google Developer Expert. After some years spent as a G Suite consultant, he is now focused on products for G Suite and Google Apps users, including add-ons such as Yet Another Mail Merge and Form Publisher. Bruce Mcpherson is a Google Developer Expert, an independent consultant, blogger and author of Going GAS, Google Apps Script for Beginners, and Google Apps Script for Developers. Report on product adoption within your domain with summary statistics about groups of users (collaborators, viewers, creators and sharers). Take advantage of key adoption metrics such as 1-, 7-, and 30-day active users for Google Drive, Docs, Sheets, Slides, Forms, Drawings and more. Simplify your calculation of “what has changed” in your domain using delta metrics which pre-calculate changes in visibility and items owned. Now, new visibility information is attached to every audit event which helps you quickly identify the permission change events that lead to files being shared differently both within and outside your domain. Learn more. While we’re aware of the need to have reliable and timely data about your domain’s users and files on Google Drive, Drive’s data and infrastructure has grown considerably, requiring us to make some difficult technical tradeoffs regarding metrics. As a result, today marks the beginning of a 12-month deprecation timeline that will retire these existing metrics from the Reports API and eventually the Admin Console. These metrics will no longer be available starting May 14, 2018. To get started using the Reports API and see all the different types of metrics you can report on for your domain, check out the official documentation. We hope you find these features useful in your reporting.